Two new portables are fixed and ready to leave the house of Phonogray! 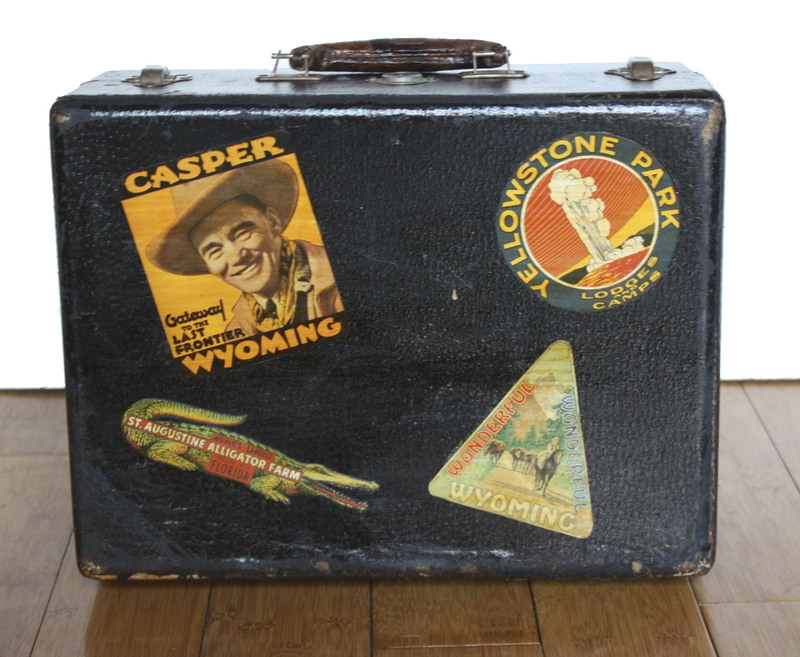 This portable suitcase phonograph has been completely cleaned, restored and tested to work. Made by Vanity Fair and dating to the late 1940s or early 1950s, the unit operates with a standard electrical plug that is in excellent condition. It is a child’s phonograph, and was originally intended as a toy. The unit operates with the red on/off switch, located beneath the arm. The turntable is original red flocked material. Included is an antique Victrola needle tin, featuring Nipper the dog listening to a phonograph. The needle tin has been secured to the motor board so that you may carry needles with you. 50 needles are included, so this unit is ready to play on arrival. The outside has been completely restored, cleaned and clear coated. 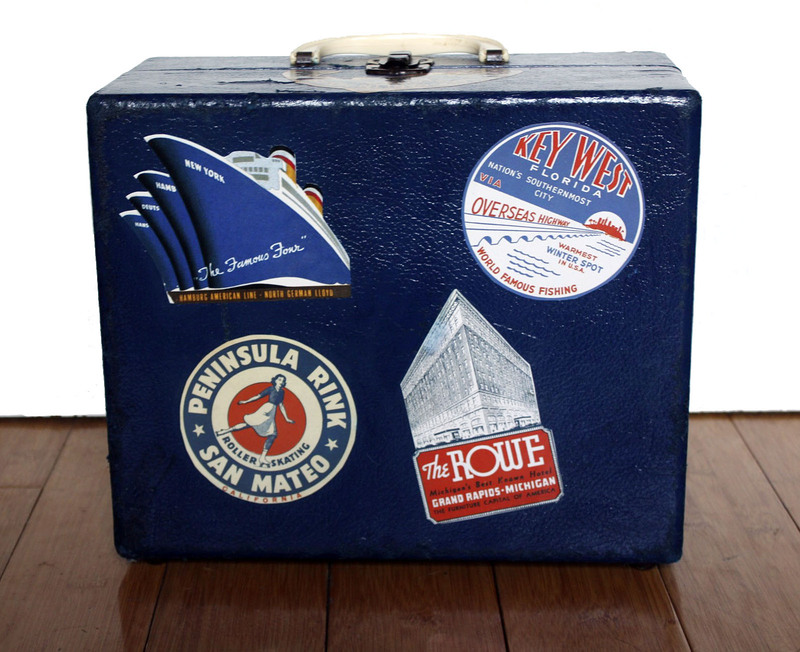 Reproduction vintage luggage stickers have been hand-cut and securely affixed to the outside of the unit. Interested? This phonograph is listed on etsy. Oh, goodness. 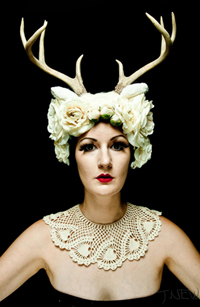 Are you ready for the next little beauty? I think Reese and I spend about 10 hours of combined work reviving this record player. It had sat in an attic for 40 or so years, but now it’s put back together and sounds amazing! 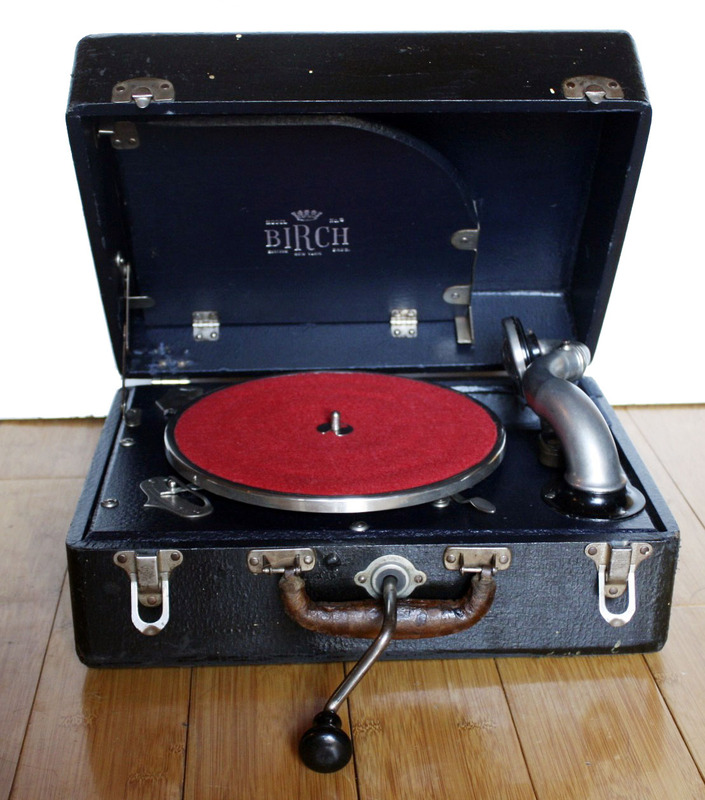 This portable phonograph was made by Birch in the late 1920s or early 1930s. It is very cute with lots of character. It has been gone through and been completely restored. It is a hand-cranked model, so it requires no electricity – making it perfect for parties, picnics, and electrical blackouts. The motor has been completely disassembled, cleaned, lubricated and adjusted. The motor runs very quiet and appears to have little wear. The soundbox was adjusted, and plays at a very loud volume, even with medium tone needles. All hardware has been polished, and the hinges on the back have been replaced. The stop bar is fixed, and the turntable fabric has been replaced with red felt. The record box on the inside cover latches to transport & store records. An antique Victor needle box featuring Nipper the dog listening to a Victrola has been securely installed under the arm to store needles. There is also a second needle cup with a hinged top that may be used to store used needles. This unit includes 50 needles. The inside motorboard and outside has been cleaned and clear coated. All loose fabric has been glued down and clear coated over. 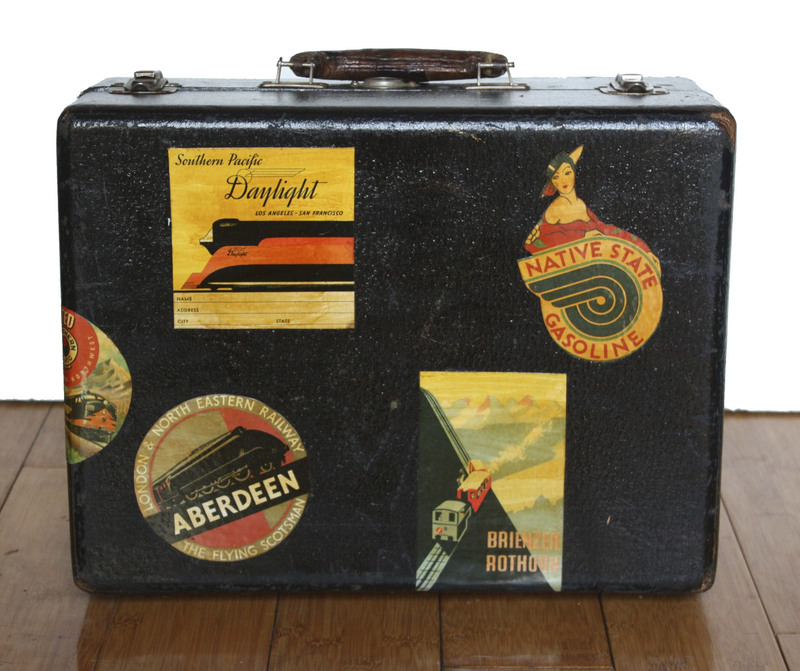 Reproduction vintage luggage stickers have been securely glued and clear coated on the outside of the portable. 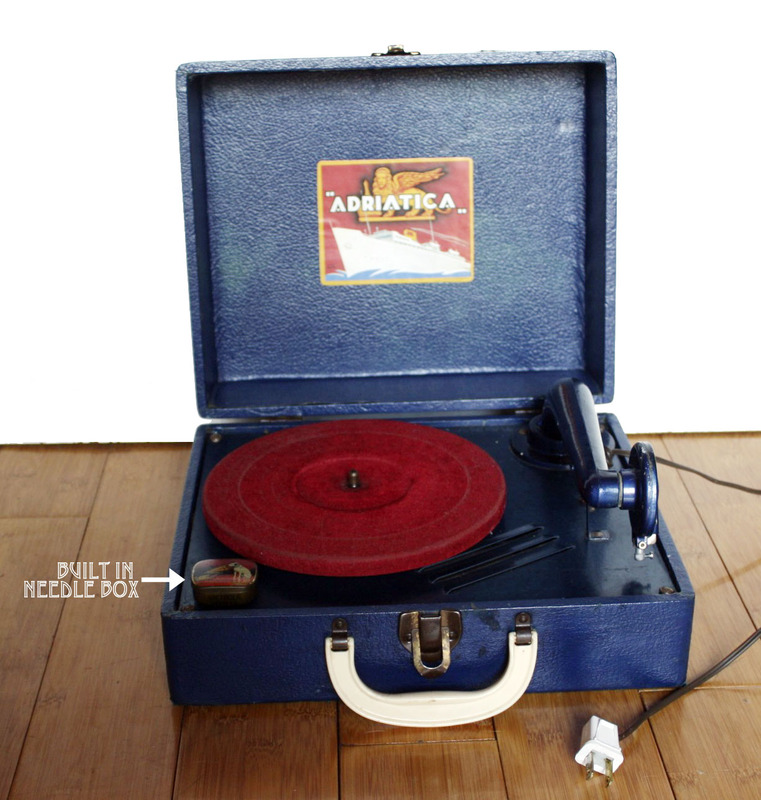 This record player plays 78 RPM records only. The crank threads into the hole near the handle, and the unit must be cranked 20-30 times to play a record. Unit stops with stop bar near the arm. Interested? This record player is available on etsy.